Taking the time to create a second record that was punchier and more refined than their debut, Shane and Simon carved out riffs on the road, then decamped to a “massive old homestead” near Yass, in country NSW. More writing took place in an odd Brisbane locale; for a week at a time, the pair would shut out the rest of the world and jam in a friend’s empty nightclub during daylight hours. The pair headed to The Grove Studios in the central coast of NSW with producer Burke Reid (MSTKRFT, The Drones, Seekae, The Mess Hall). The goal was, says Simon, to “make it sound bigger and badder”. 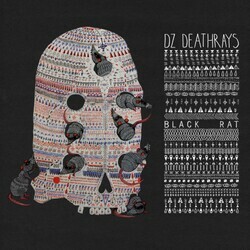 Full of sinister tones, and pulsating with a menacing air, this fuzzed-out punk cacophony shows a DZ Deathrays that’s louder than ever, while displaying their growing maturity and songcraft. This new offering finds the two-piece showcasing all of the traits which fans and critics around the world have come to love, while also revealing a new layer to the band’s songwriting skills.